Connect to your Pinterest profile: https://www.pinterest.com. Scroll to the "Email Notifications". 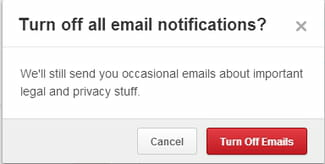 Toggle the "Get email notifications" button to "No". Confirm your selection, by clicking on "Turn Off Emails". Note that: you will still receive the important emails (new privacy features, TOS...) from Pinterest. Published by deri58. Latest update on November 6, 2016 at 02:03 PM by Olivia Long. This document, titled "Pinterest - Turn off email notifications," is available under the Creative Commons license. Any copy, reuse, or modification of the content should be sufficiently credited to CCM (https://ccm.net/).